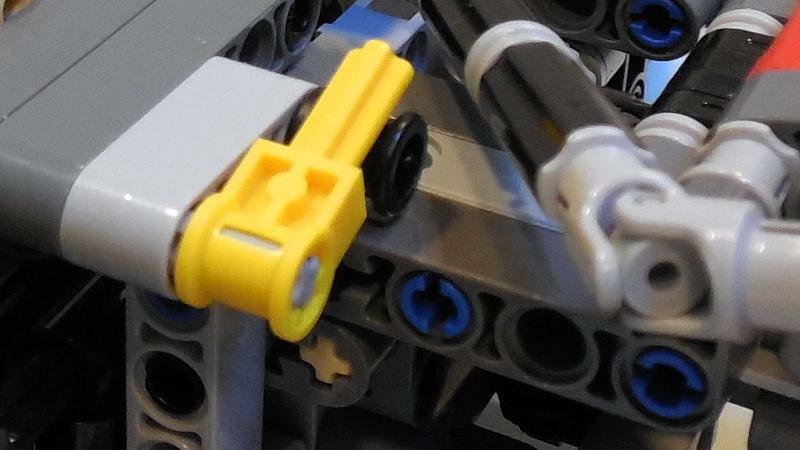 How did you connect those two axle joiners? With a 2L axle? Why not use a 5.5 axle here? I actually need a 6.5L axle and I can't think of a way to obtain that length using a 5.5L axle. Initially I used a 6L axle that was inserted only 0.75L into both U-joints, but the axle slowly slided out of one of the U-joint and fully inserted the other. Eventually the axle popped out of one of the U-joints. This way - with indeed a 2L axle inserted into two axle joiners for 0.75L and a half bush in the middle - the full 6.5L is spanned, so it won't pop out of the U-joimts and the 2L axle in the middle won't go anywhere. @Meatman, I managed to improve the shifting links. You were right that the links were disaligned by almost 1 stud over their full length. The intention was to lengthen the change-over catches max .5 stud to avoid friction and double engaged gears, but I extended them by appr. .75 stud. Together with the ball-joint with axle that doesn't fully insert the disalignment was simply too much. So I removed two half bushes to make sure the catch extensions are exactly .5 stud and at the same time I replaced the +0 liftarms attached to the shift axle with 2 2L thin liftarms and the attached ball-joints with pin with ball-joints with axle. This also reduces the disalignment. Now the red clutch gears at the front are engaged practically as good as the ones in the back of the gearbox without reintroducing any squeezing or double engaged gears. Thanks again for pointing this out . It made the whole setup work even better. Again this looks great. I'm looking forward to getting to my Mac and checking out the files you shared and really looking forward to seeing where this goes! Although the overall rigidity of the main structure was quite okay - it's much stiffer than for instance the Porsche chassis - I wasn't completely satisfied about the stiffness in the area directly behind the seats. The 15L liftarms running between the seats were only connected with a single pin to the 5L levers running over the shifter compartment behind the seats. So I made some adjustments to improve this. I also finally received the right parts to make red calipers for the front wheels . 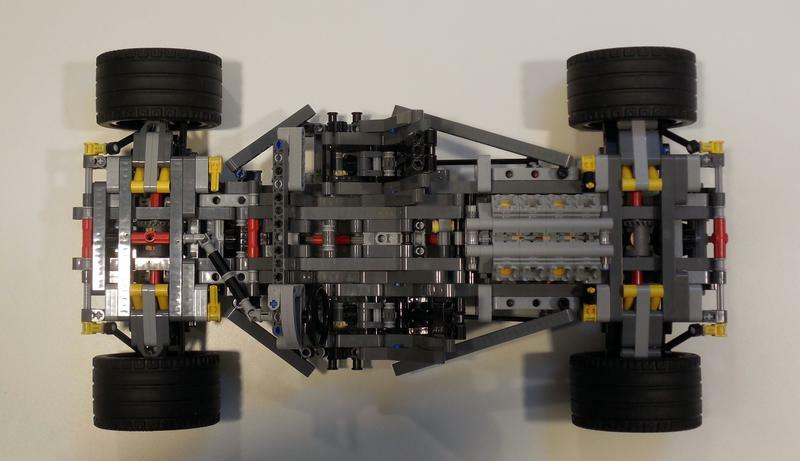 LXF-file (with placeholders for the Porsche wheel hubs!) can be found here. Comments and (suggestions for) improvements are welcome. Yeah, I'm affraid that 'll be the next step. I have to admit designing the bodywork feels like a bigger challenge than the chassis. Building chassis is my comfort zone. But I will certainly give it a go. Before I start with the body here's a last addition to the chassis which secures the seats properly and reduces twist significantly. It relies on the properties 3^2 + 4^2 +12^2 = 13^2 and 3^2 + 4^2 + 5^2 ≈ 7^2 (7.07 to be more precise). I also managed to move the seats half a stud backwards. Gives a little more air behind the steering wheel . 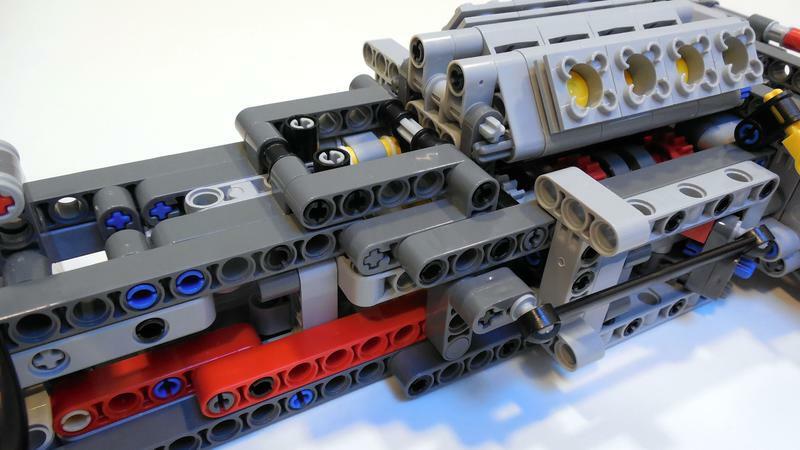 I gotta say, I love that gearbox layout. So clever. This chassis avoids most of the supercar issues I get bothered by. The center console isn't too wide and the engine isn't mounted to the roof. Do you have plans for more functions? Thanks! The same things bothered me and a few more: Ground clearance, suspension travel, gearbox routed through the entire chassis, etc. 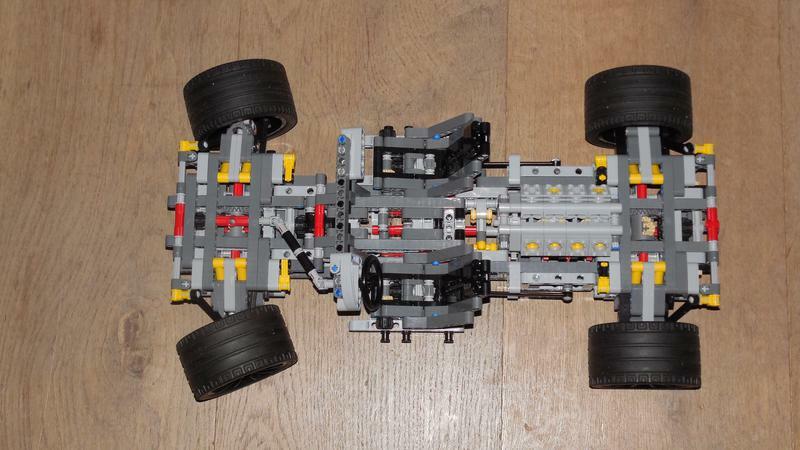 Btw, the gearbox can be simplified even further when there would not be an engine on top. In that case the 4 axles to the side of the central diff can be replaced by two above the diff, between the driving rings and clutch gears. More functions? I want to have HoG steering, openable doors, openable hood etc as part of the bodywork. But the chassis is done as far as I'm concerned. I finally received my 8 red normal springs and replaced the yellow hard ones with them. Makes a lot more fun! 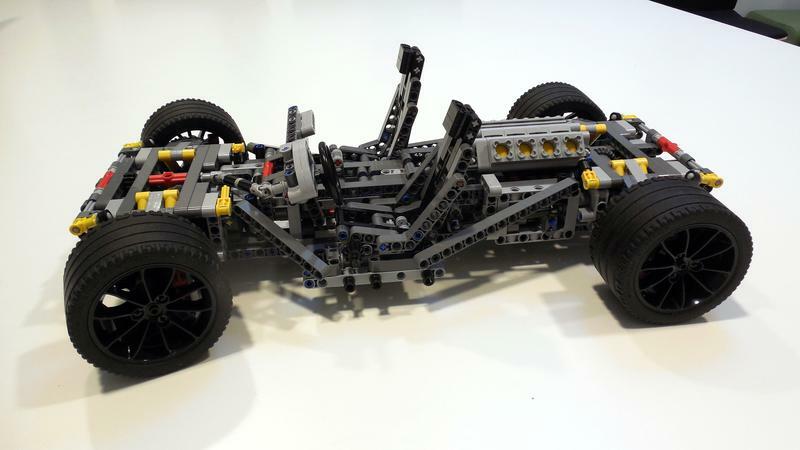 The idea is to tweak the suspension by adjusting the way the torsion bar running through each upper wishbone is secured. With the softer springs this works out very well too! I will have to wait and see how they behave with the extra weight of the body later on, but for now the red normal spring seem to be the right choice. When the body weight requires more resistance, I can always revert to the yellow hard springs. Looks very well proportioned! But please, add HOG steering. I like it a lot, runs so smooth... just like Paul, You nailed it too! Actually, I would even stop at this point: no bodywork, just clean up the chassis with less bulkier areas at the swingarms (if it is possible) - and voilá, a quite proper demonstration stuff. Okay, I know, with removable body, it is doable in seconds too. So go on! One question: do the torsion bars do something on the model, or are they actually just cosmetic add-ons? Thanks! Don't worry, I will add HoG steering. There enough space in the area just behind the dashboard. Yeah, Paul's model rocks and it was in fact one of the triggers to start my own awd chassis. Apart from the engine - with the 16t gear inside - I followed my own path and could come up with something quite different. After replacing the hard shocks with normal ones both the anti-roll bars and the torsion bars really make a difference. When I decouple the torsion bars, the shocks are to weak to carry the car by themselves. The nice thing about torsion bars is that their resistance starts subtle and increases fast when they get twisted. This makes dropping the car possible without having the bottom of the car touch the ground. And the shocks actually work as absorbers this way. They absorb the jumping spring effect of the torsion bars. The effect of the anti-roll bars is harder to observe. However compressing only one side of for instance the front suspension is significantly harder with the anti-roll bar than without. You can feel the difference. Your suggestion to leave it like this - as demonstration stuff - is tempting. Bodywork is not really my cup of tea, but I do have some aspirations there. It might also be a starting point or study material for others as you can easily leave things out. 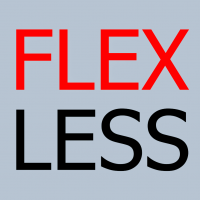 You can skip the torsion bars and/or the anti-roll bars. You can also quite easily skip the entire front drive and replace the central diff with a 24t gear and a 16t gear. I think I will first make a minimal - beam only - body, also to draw the attention away from the bulky anti-roll bars a little. And then I will take the take time for a more advanced body. I know that's what you would like to see. 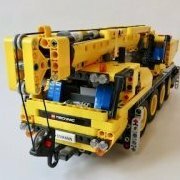 I'm still awaiting my son to enter motorized Technic sets . 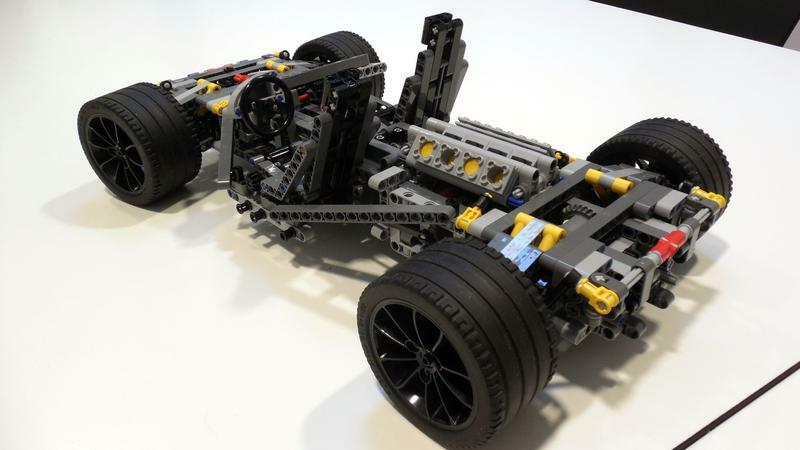 IMO this chassis serves as learning material par excellence - for beginners and advanced builders equally. You are on the right path, you made your own and and that´s why it has become so good . One thing I personally don´t like so much though are the diagonal beams, but only due to its offbeat looks. 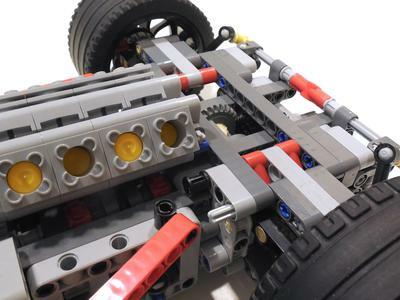 Undoubtedly they add to the rigidity of the chassis and prevent the twisting around the longitudinal axis, but maybe they won´t disturb the aesthetics of your final model... I´d prefer to make some kind of roll cage on top / a well designed stable roof construction could do the job as well. Thanks for the explanation Didumos69 - I already learned something. Pff, I can't count I thought the total length was 5.5L, instead of 6.5L. How about using the older 4L U-joints? Or would the old-grey be too ugly? No guys, those are not strictly legal techniques. I'm sure you can come up with a better solution that fits the system. 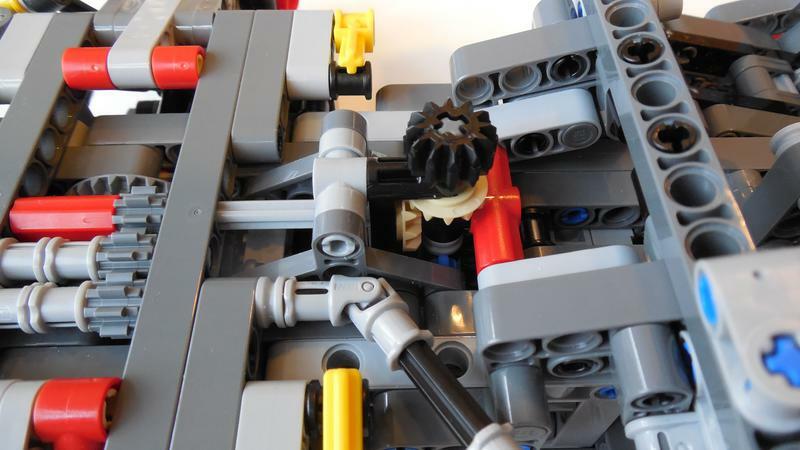 Using some gears is not a bad thing (and for realistic steering wheel rotation you'll need some down-geering anyway), and you'll need something for the HOG anyway too. I guess I should. However, to motorize drive, steering and shifting I'm afraid I would have to redesign the whole thing. But this might very well be my next project. 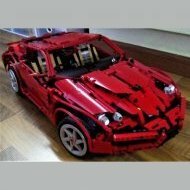 I would like to see a motorized vehicle that can actually use the gearbox as it was meant to be used: to shift gears smoothly while driving and actually take the speed of the vehicle up to the next level, gear by gear. Thanks @brunojj1! 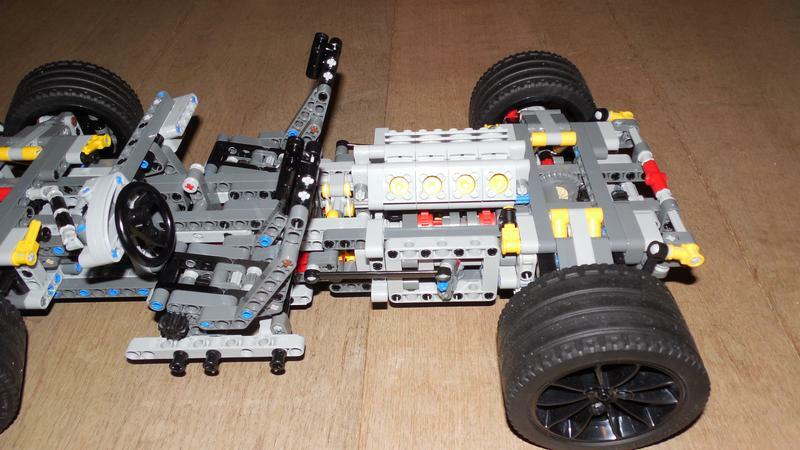 The diagonal beams are actually the result of my first exploration into the bodywork. But they turned out to give just the necessary rigidity if you regard the chassis as something self-reliant. Nevertheless I'm more and more moving into the direction of making a minimal body that adds rigidity and prevents the longitudinal twist. Just like what you're suggesting with a stable roof. Or a firmly secured roll-over bar. So I expect the diagonal beams to be something temporary. I don't know yet. 4L u-joints are not an option for me. The ones I have, have become very fragile and I prefer using present-day parts only. But I somehow like to hold on to the u-joints, they add to the overall elegance of the chassis in my opinion. 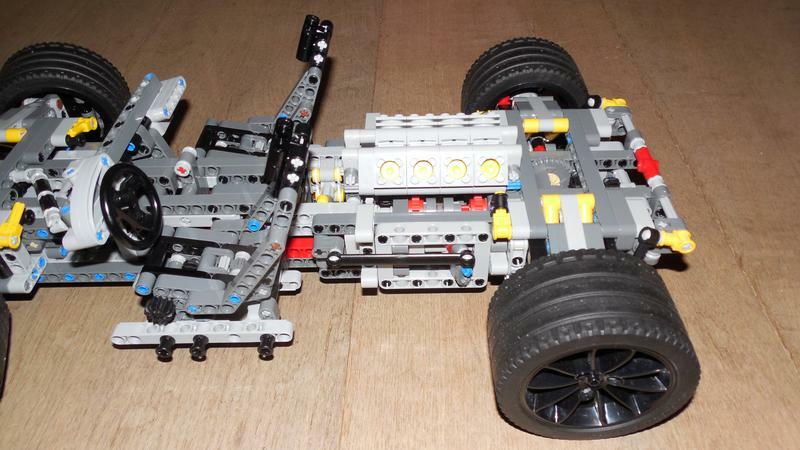 And even though the 2L axle in the middle is only inserted by 3/4 stud into the axle connectors, the whole thing sits very secure between the two u-joints. I didn't look over that area for days and nothing happened with it, not even after some monkey tests. And when it comes to 'strictly legal techniques', my torsion bars are not strictly legal either. 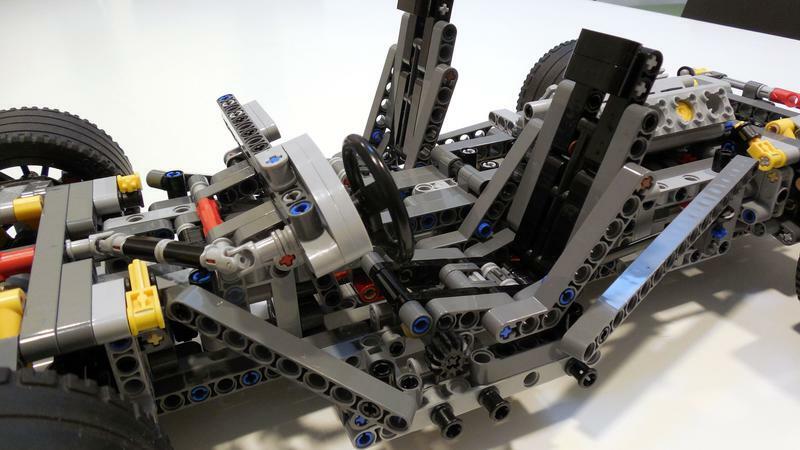 I do agree I should gear down the steering though, but I can also very easily do that with the gears at the front side of the front suspension. I can even reduce by 12:20 twice. Then again, I'm currently working on the HoG steering and like @Lipko indicated, this might affect the whole steering setup. Who knows where that will go. Over the weekend I geared down the steering and had my go at HoG steering. As rightly mentioned by @Lipko this should be included. This also solved the 6.5L axle issue between the two steering U-joints - also addressed by @Ludo Visser a few posts back. The HoG serves as the primary steering device for playing. The steering wheel of course also operates but suffers from a little more slack because of the extra gears. I geared down by 12:20 by replacing 2 of the 4 bevel gears at the front of the front axles module. I could reduce by 12:20 once more, but it seems okay to me like this. 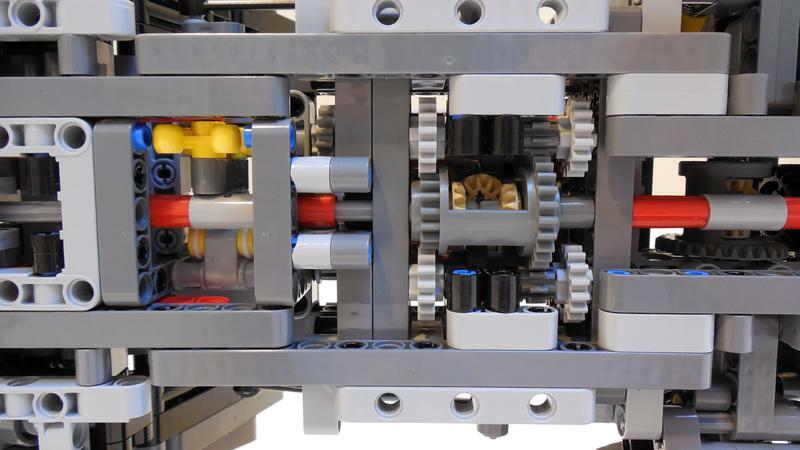 Personally, I'm not a big fan of putting gears in a row to translate rotation, but this way I could hold on to the 'elegance' of the u-joints and the HoG works very smoothly. The HoG is also quite compact and solid; maybe it's hard to see, but besides the toggle joint, the HoG axle is also held in place by a pinhole with pin inserted in the red #2 connector nearby. Feel free to comment. It'll only help me make this model better. I wasn't really content with the HoG steering. I simply don't like three 8t gears in a row, they come with a lot of slack and make steering with the steering wheel quite unpleasant. Only had time to work in LDD lately, but I think I have found a better way to combine a working steering wheel with HoG steering. Would this be better? I also did some work to reduce lengthwise twisting of the entire structure. Now I have to find some time to build this. The black 7x5 liftarms are intended as the base of the driver's cage . I know what you mean, the CV-joint can only handle a limited angle. I've recently built a model that uses CV-joint only at the differential-end, while using the good-old universal joint at the hub-end. 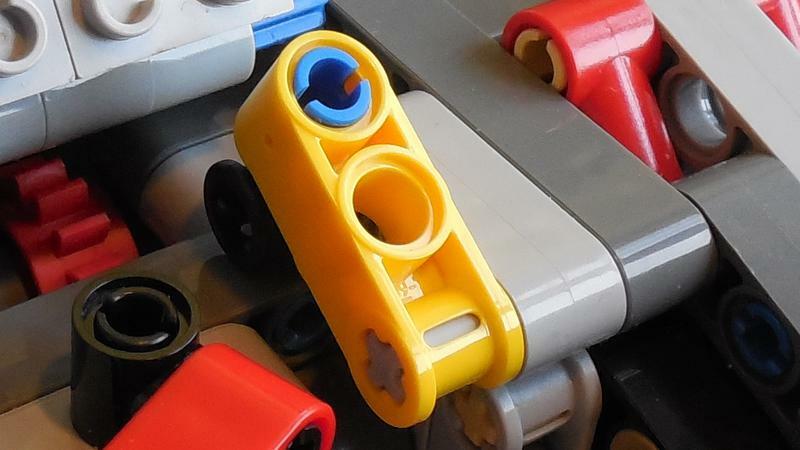 Granted, won't be able to use Lego's hubs, but using custom hub + U-joint would allow for KPI, camber and steering angle of about 40-45 degrees - much more playable be it manual or motorized, IMHO. Yeah, you're right. I did exactly the the same in my Steppenwolf. I did need to add an extra half bush to secure the end of the CV-joint inserted into the diff though. Otherwise the CV-joints would eventually get pulled out of the diff because the distance between the CV-joint and the U-joint varied in turns. 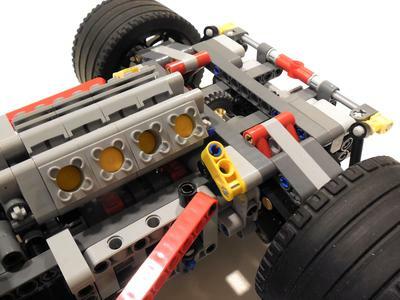 Hmmm, the only issue I see with steering is that it's maybe hard to perfectly center the steering wheel (the 2L axle not inserted between the U-joints implies I'm right). For me perfect centering is a must in my designs. I usually try to use Madoca's 12/20*12/20 reduction scheme with the transfer axle rotated 45 degrees. Though I have to admit that in the telehandler the steering wheel is only easy to be centered by luck. But apart from that model, all my models after the V12 Coupe have perfect and easy to align steering wheels and this is a major part in the design process.